In a month, I’ll be leaving EPI to begin graduate school in Seattle, which makes this my last jobs day. I’ve learned a lot in my three years at EPI, and I thought it might be useful to write a series of posts explaining how the work we do has shifted the way I think about economics. Of all the tasks at EPI, frantically gathering and analyzing new employment data on the first Friday of every month has been one of the most formative. Jobs day is like monthly report card on how the labor market is doing for workers. While almost every news station covers the unemployment rate and jobs numbers, the full report contains a wealth of indicators and information that take a bit more analysis to understand. That month and the next three years made me realize that “recession” and “recovery” don’t really cover the full scope of economic health. Instead of all indicators returning quickly to normal as smooth textbook graphs might indicate, the labor market took a turn for the weird. EPI’s “missing workers” measurement is a result of how the unemployment rate is defined. The unemployment rate is the number of people officially classified as unemployed divided by the total labor force—the sum of employed people and the unemployed. But, for jobless people to be officially classified as unemployed, they have to be actively searching for work. If they’re not actively looking, they’re just jobless people who are not in the labor force. In the years following 2011, the number of unemployed people decreased, but this was driven more by jobless people being classified as not in the labor force rather than by previously jobless people finding employment. We can see this by looking at the employment to population ratio (EPOP) of prime-age adults (between 25 and 54) and the unemployment rate side by side. 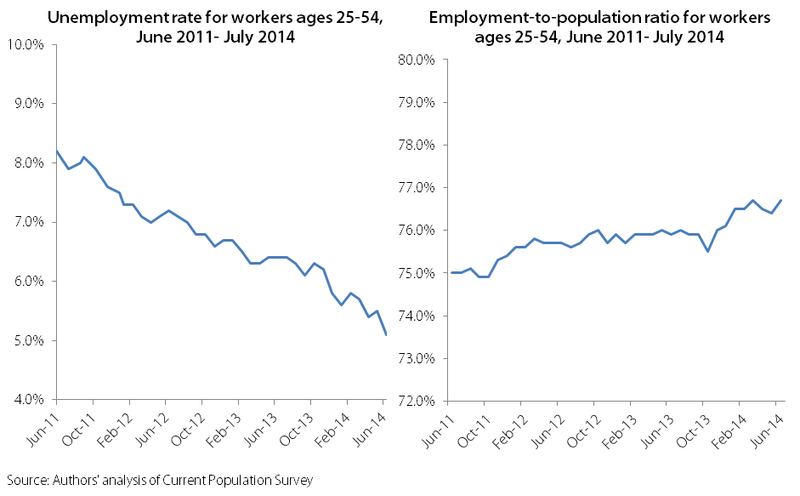 Improvement in the EPOP rate has been much slower than improvement in the unemployment rate. Of course, part of the decline in labor force participation could be voluntary, and with the leading edge of Baby Boomers starting to hit their mid-60s, this is important. We decided to figure out how much of the decline in labor force participation was not voluntary, instead consisting of unemployed workers who stopped searching because of the economy’s prolonged weakness, and who would likely come back if job opportunities improved. As of July, there are nearly six million missing workers; if these workers came back into the labor force, the unemployment rate would be 9.6 percent, rather than the 6.2 percent it is today. This last piece of information is particularly crucial for understanding labor market health today. It’s easy to diagnose poor labor market health when unemployment is stubbornly high, but when living standards for most Americans aren’t improving, even as the unemployment rate ticks down, it can be hard to figure out what factors are to blame and what to expect in the future. I see this with my peers, who read that the economy added over 200,000 jobs, and that the Fed may start reining in growth soon—when they are in jobs they are overqualified for or having a hard time getting on the bottom rungs of their career ladder at all. Not only are 29.6 percent of recent high school and college graduates either unemployed or underemployed, employers can get by with paying meager wages because of the weak labor market (and don’t even think about benefits like a 401k or employer-sponsored health insurance), which will hurt young workers’ earnings potential for the rest of their lifetime. And to be clear, young adults are not uniquely screwed—instead we’re just part of the general across-the-board suffering inflicted by the Great Recession and the failure to bring about a full recovery. Until we see substantial growth in the employment to population ratio when the missing workers come back and find jobs, workers—including young ones—unfortunately are going to have to scrape by to make ends meet.